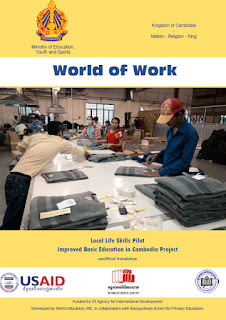 The manual World of Work is intended to assist learners in acquiring knowledge, skills and experience in preparation for employment in a variety of occupations in their community, province, country and world. The understanding of the variety of work and soft-skills help students play an important role in their society and in their homes. Learning how to prepare for work at an early age and connecting skills with needs and goals will help young adults think about expected behaviors in the workplace and how to become a good employee. We hope young people can become more forward thinking and goal oriented in their job-readiness. The soft-skills introduction aims to provide learners with a strong work ethic; effective workplace communication and relationship skills; learn appropriate behavior at work; how to take on responsibility; and flexibility and honesty in the workplace.